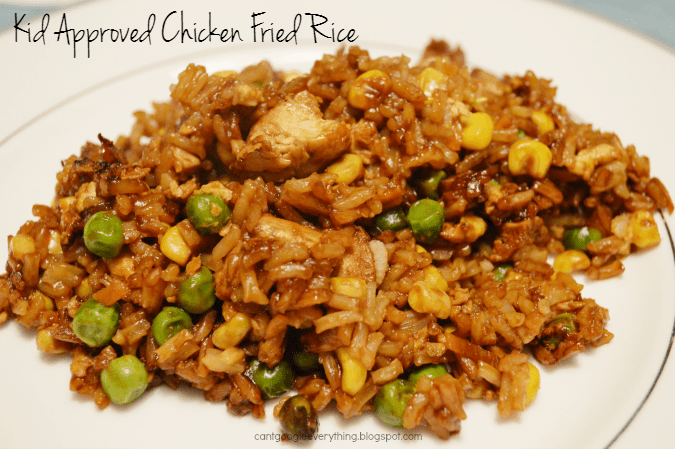 Kid Approved Chicken Fried Rice! Fried rice is an easy and delicious weeknight meal and easy to customize using leftover veggies you have at hand! 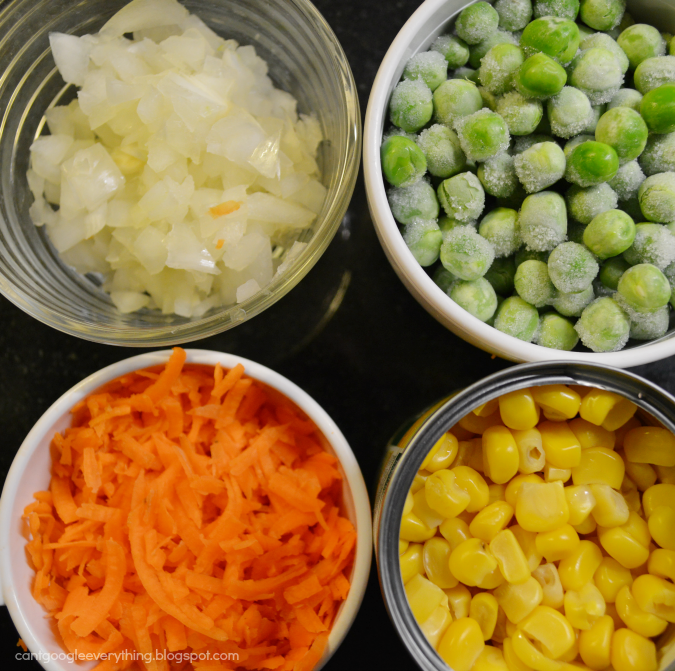 This is also a fun way to get your kids involved with cooking, because they can help chose what to put in and all the veggies mix together in vibrant color. To make it even easier, we used store made roasted chicken so it really was a quick meal to prepare! Heat the butter or oil in a large sauce pan. Add veggies and sauté until veggies are cooked and soft (about 5 minutes). Push veggies to the side of the pan to make a hole in the middle. Crack the eggs in a bowl and scramble together. Add eggs to the empty area of the pan and cook with veggies, scrambling around until they are fully cooked. Then mix them all together with the veggies. Add the cooked rice and shredded chicken to the pan. Cook all together a few minutes until everything is heated up. Add the soy sauce and toss to coat. If you enjoyed this recipe, be sure to pin this post using the image below! 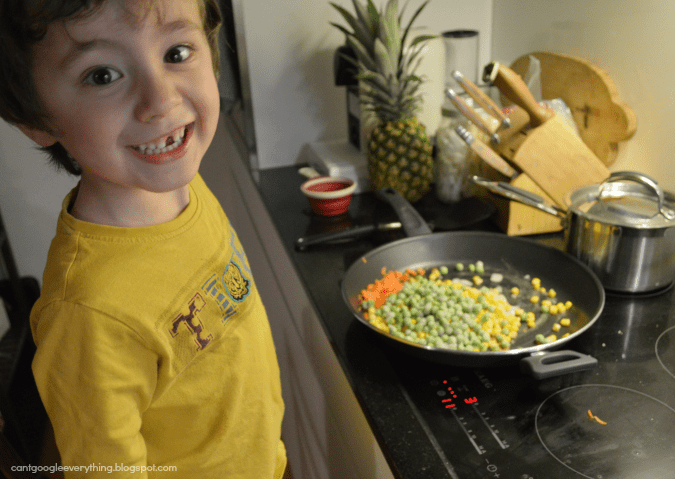 Do you cook with your Mini Chef? Come link up with us each week for Mini Chef Mondays! 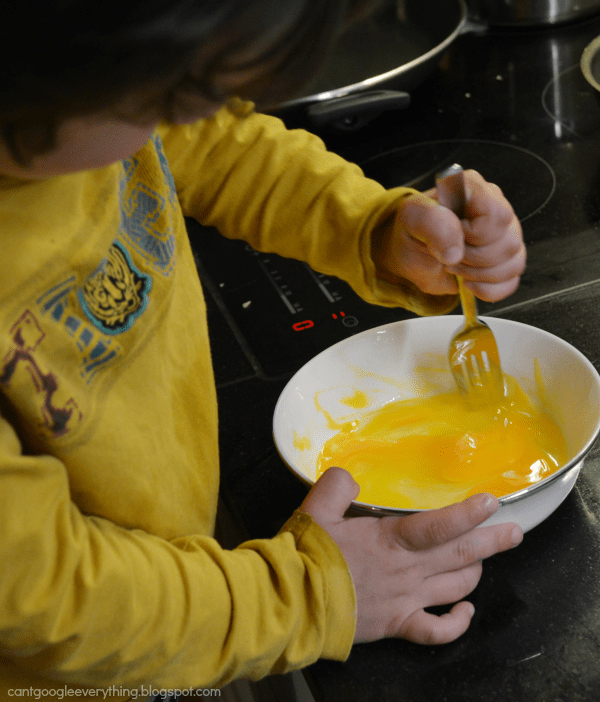 Link up your blog post or instagram photo of your mini chef in the kitchen or recipes you made together with your kids! We’d love to have you! Fried Rice is definitely a favorite in our home. Our Mini Chef just made some for dinner the other night too! We love fried rice. Great reminder. We haven't had it in ages. Thanks for the great recipe. We made this tonight w/ shrimp! So good! 😀 I threw the shrimp in after the veggies got warm enough and then after the shrimp was cooked I threw in the egg.